The bright white dot near the center of this image is one of the brightest stars in our galaxy. 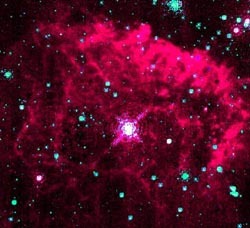 The star is partially hidden behind interstellar dust (pink clouds). Analysis of data from dust detectors aboard the Ulysses and Galileo spacecraft have revealed that there is a stream of interstellar dust flowing through our solar system. These grains, of unknown mineralogy, are extremely small - generally measuring less than 1 µm—and are very difficult to collect in the Earth’s stratosphere by current techniques using high altitude aircraft. The grains shown here were collected on the Stardust mission. Analysis of these particles will represent the most difficult challenge of the post-flight operations. Study of these grains will help unlock the secrets of the stars, and the creation of chemical elements.